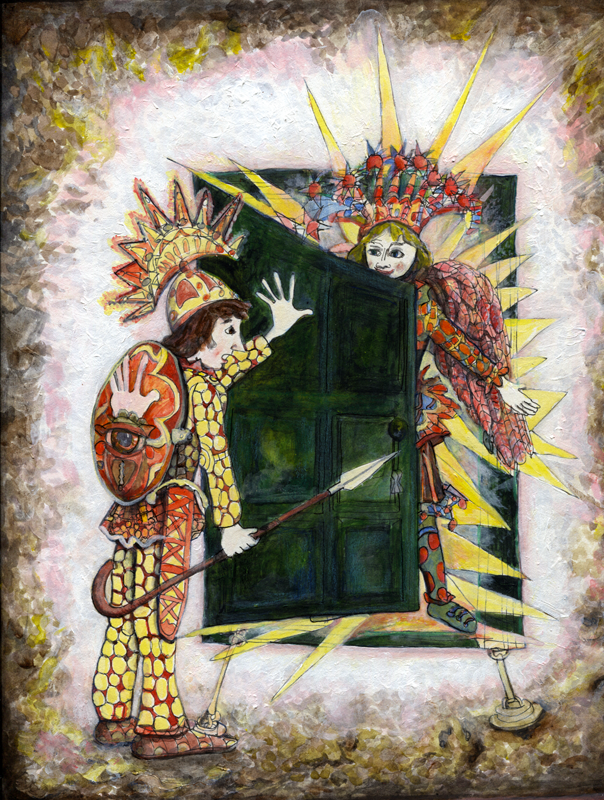 Jacob’s meditation on opening the door to an angel. I will not let it through. It will not wrestle with my broken life: it is not broken; I am a man of great standing in my world. Will it consider the ramifications of stealing from my twin: for am I not the better of the two? Quicker witted? Hipper? Better looking, and my booty is vast. Was I not therefore justified ganging with my mother confusing my dying father and taking what should have been mine. So why am I so scared? I send my people and possessions before me in small groups to convince my other half I am weak and poor. For real, now I am at sea in a boat made of pain, regret and confusion. Should I not let the angel in and wrestle towards some sort of resolution? She is so full of light for sure; it would be worth the struggle to be with the lightness. To be rebooted by God. This entry was posted on 12 January, 2012 in homepage, Uncategorized and tagged angels, Art of the imagination, devil, identity crisis, jacob's meditation, nick victor, painting, reboot. Bookmark the permalink.